Note: I originally wrote this with the Babble audience in mind, but haven’t submitted it yet. Since it can take them months to post something, I thought I’d share it tonight here on my blog for kicks. As my confidence as a mom has grown, my diaper bag has shrunk. You could argue this inversely proportional observation is a silly one to make, but it’s completely true. Before Maya was born, I carefully eyed the diaper bags I saw moms and dads carrying around. I saw some huge bags overflowing with sippy cups and Snack Traps, some cross-body bags, some backpacks, some bags that didn’t even look like diaper bags. At Babies R Us I was absolutely overwhelmed by the opportunities before me, and surfing around online was even more dizzying. We decided on a roomy, pocketed light aqua and chocolate brown Carter’s diaper bag with a changing pad and interior pouch — all of which matched our stroller/car seat. We were having a girl, but I didn’t want anything pink. I wanted something neutral enough that Luis could tote it around without feeling silly –so it was perfect. L’s boss gifted it to us and filled it with the essentials: diaper cream, wipes, a Dreft on-the-go stain stick, disposable changing pads, a Johnson & Johnson travel kit and other goodies. I lugged that big bag around for the first year, filling it with all that and then some: multiple changes of clothes, burp cloths, a small blanket, extra socks, teething rings, books, disposable diaper bags, toys, teething tablets, Infant Tylenol, a thermometer (after Maya’s frightening febrile seizure last November we couldn’t be without it), pouches of pureed food, puffs, breast milk bottles, packets of instant formula, extra bottles … you name it, I had it. As a Type A girl, I was so afraid to be missing something; to not be organized or caught unprepared … so my solution was to take the kitchen sink approach. This approach worked well for the first year, especially since we travel quite a bit. Let’s be honest; the last thing you want to do is realize you are out of wipes at 40,000 feet. But by the time Maya hit a year, she was eating some solids, past the days of blow-outs (i.e., didn’t need four outfits for a day at the park), and I realized all she needed was one or two toys or books to be happy – which meant I packed less and less in the bag. Soon after the year mark, we banished the official diaper bag to a closet and started using the small black Gerber cross-body backpack we’d gotten at the hospital as our go-to diaper bag. Because it was small, I had to be especially judicious with my bag’s real estate – which simply meant I didn’t bring five purees; only one. Just the bare-bones necessities. And now that she eats what we eat, sometimes now when we go out for errands I just stick a banana, a water bottle, a change of clothes, a sippy cup, a diaper or two, and wipes in my regular bag and call it a day. Still prepared to meet all her needs, but without all the extras. The problem is, I still tend to need two bags when we travel (car or plane) because none of my bags are quite big enough. So I’ve been on the hunt for a giant bag that could function as a work bag (stashing all the necessities for the work day including my laptop, meals, etc.) and double as a diaper bag/travel bag, too. 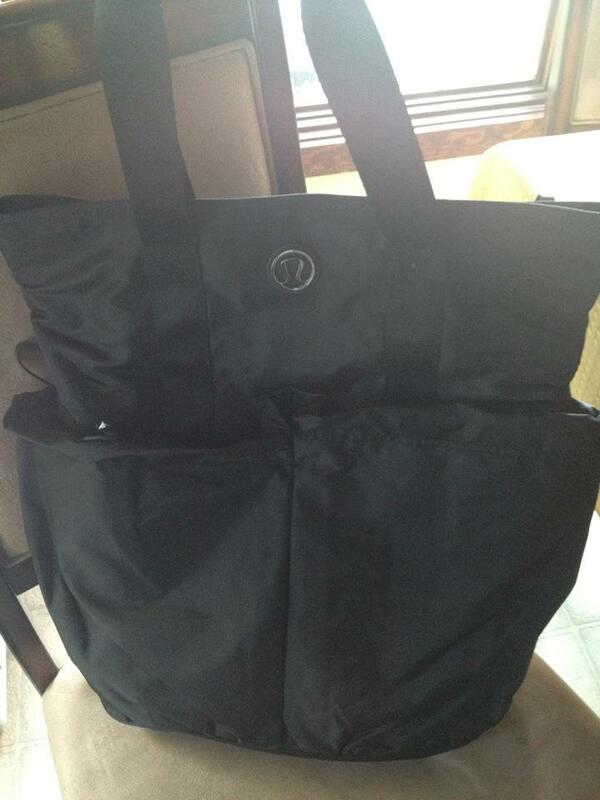 Lo and behold, last week, I found this amazing bag on sale at lululemon, the Flow and Go Tote. It arrived tonight and I could not be more over the moon about this bag. Finally — a super-cute and functional bag that can hold my laptop, notebook, breakfast, lunch, water bottle(s), workout gear, phone, iPad, wallet, small child (haha) etc. Adios, days of schlepping five separate bags to the office each day. And the best part is it moonlights as a perfect-sized carry-on tote and doubles as a diaper bag. So now things have come completely full circle. I have this huge bag — much bigger than my original diaper bag, but it houses everything I need for the day: for work, play, baby, etc. I’m definitely one happy mama! How about you? Has your diaper bag shrunk from the time your baby was a newborn? Or did you eventually just start using a bigger bag for everything versus a purse for you and a diaper bag for baby? My new bag: a busy gal’s dream come true! It’s hard to find your posts in google. I found it on 16 spot, you should build quality backlinks , it will help you to increase traffic.